I know you're not as into global music as I am, but I think you'll like this album. 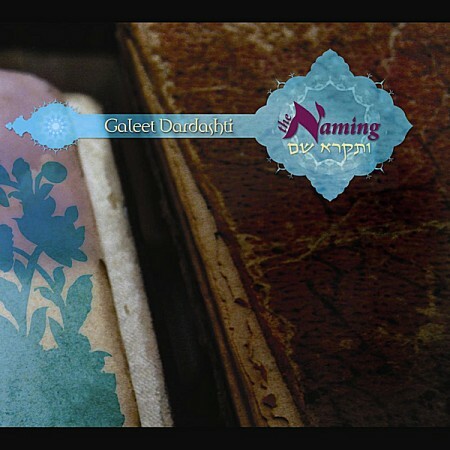 It's by an artist named Galeet Dardashti, who grew up in the United States, but has roots in Judaism and in the Persian culture of Iran. You don't need to know much about that to enjoy the album, just that she uses her roots as a jumping off point to explore some of the strong women characters in the Bible. We're talking women such as Eve, Leah, and Rachel. The CD's title song "The Naming" recounts how these women name their children. There's also "Hagar/Sarah," which recounts the rivalry between Hagar and Sarah, whose descendants still are, as Dardashti writes in the liner notes, "embroiled in an intractable cycle of violence." At the end of the song, she sings "dueling headlines from recent Palestinian and Israeli newspapers." But this isn't really a political album, it's about the Biblican women who often play second fiddle to the patriarchs. Other songs tell about the Queen of Sheba, Dinah the daughter of Leah, and less familiar characters such as Queen Vashti and the witch of Endor. In Iran, my grandfather was huge. He was one of the biggest singers in his day. He would sing at the Shah’s palace, he had a weekly radio show, back when there was no TV, so everybody would listen every week. They knew he was Jewish. Throughout the Bible texts, Dardashti says, "women are marginalized. I am trying to show how for the most part women try to overcome that inequity. And how they can rise to the challenge and be powerful and funny." Which brings us to today, Mother's Day. You may not have stories told about you thousands of years from now, but I'll gladly sing your praises, how your gentle, firm, spiritually inspired guidance and wisdom have helped shape me and protect me and inspire me. P.S. If you want to find out more about Galeet Dardashti, here are a few helpful links.